Religion in Ethiopia consists of a number of faiths. Among these mainly Abrahamic religions, the most numerous is Christianity (Ethiopian Orthodoxy, Pentay, Catholic) totaling at 62.8%, followed by Islam at 33.9% . There is also a longstanding but small Jewish community. Some adherents of the Bahá'í Faith likewise exist in a number of urban and rural areas. Additionally, there are a few followers of traditional faiths, who mainly reside in the southwestern part of the country. According to the national census conducted in 2007, over 32 million people or 43.5% were reported to be Ethiopian Orthodox Christians, over 25 million or 33.9% were reported to be Muslim, 13,7 million, or 18.6%, were Protestants, and just under two million or 2.6% adhered to traditional beliefs. Neither in the 2007 census, nor in the 1994 census, were responses reported in further detail: for example, those who identified themselves as Hindus, Jewish, Baha'i, agnostics or atheists were counted as "Other". The Kingdom of Aksum in present-day Ethiopia and Eritrea was one of the first Christian countries in the world, having officially adopted Christianity as the state religion in the 4th century. Ethiopia was the only region of Africa to survive the expansion of Islam as a Christian state. In general, most of the Christians (largely members of the non-Chalcedonian Ethiopian Orthodox Tewahedo Church) live in the highlands, while Muslims and adherents of traditional African religions tend to inhabit more lowland regions in the east and south of the country. The numerous indigenous African religions in Ethiopia operate mainly in the far southwest and western borderlands. A church in Addis Ababa. Ethiopia has close historical ties to all three of the world's major Abrahamic religions. Christians form the majority of the population. Islam is the second most followed religion, with 33.9% of the population being adherents. 2.6% of the population (mainly in the far south and southwest) follow traditional religions; other religions (Bahá'í, Judaism, etc.) make up the remaining 0.6%. Ethiopia is the site of the first hijra in Islamic history and the oldest Muslim settlement in Africa at Negash. Until the 1980s, a substantial population of Ethiopian Jews resided in Ethiopia. The country is also the spiritual homeland of the Rastafari religious movement. 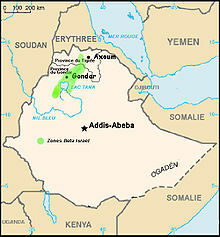 Ethiopia is one of the oldest Christian states in the world. The Ethiopian Orthodox Church is an Oriental Orthodox Church, which is the largest Christian denomination in Ethiopia. It was part of the Coptic Orthodox Church until 1959, and is the only pre-colonial Orthodox church in Sub-Saharan Africa. The apostle St. Matthew is said to have died in Ethiopia. According to the government's 1994 census (which the CIA World Factbook follows), 61.6% of the Ethiopian population was Christian: 50.6% of the total were Ethiopian Orthodox, 10.1% were various Protestant denominations (such as P'ent'ay and the Ethiopian Evangelical Church Mekane Yesus), and Ethiopian Catholics constituted 0.9% of the population). The U.S. State Department estimates that just over 50% of the country is Christian (40 to 45% of the population belongs to the Ethiopian Orthodox Church, about 10% are members of Christian evangelical and Pentecostal groups). Orthodox Ethiopian Christians are predominant in the Tigray (95.6%) and Amhara (82.5%), while the majority of Protestants live in the Southern Nations, Nationalities and Peoples Region or SNNPR (55.5% of the inhabitants) and the Oromia Region (4.8 million or 17.7%). According to the government's most recent census from 2007, Christians constitute 62.8% of the total population, with the largest group being Ethiopian Orthodox Christians at 43.5%, followed by Protestants 18.6% and Catholics at 0.7%. A 2015 study estimates some 400,000 Christian believers from a Muslim background in the country, most of them belonging to some form of Protestantism. A leather painting depicting Ethiopian Orthodox priests playing sistra and a drum. The Kingdom of Aksum was one of the first nations to officially accept Christianity, when St. Frumentius of Tyre, called Fremnatos or Abba Selama ("Father of Peace") in Ethiopia, converted King Ezana during the 4th century AD. Many believe that the Gospel had entered Ethiopia even earlier, with the royal official described as being baptised by Philip the Evangelist in chapter eight of the Acts of the Apostles (Acts 8:26–39). Orthodox Christianity has a long history in Ethiopia dating back to the 1st century, and is dominant in northern and central Ethiopia. Both Orthodox and Protestant Christianity have large representations in southern and western Ethiopia. A small ancient group of Jews, the Beta Israel, live in northwestern Ethiopia, though most emigrated to Israel in the last decades of the 20th century as part of the rescue missions undertaken by the Israeli government, Operation Moses and Operation Solomon. Some Israeli and Jewish scholars consider these Ethiopian Jews as a historical Lost Tribe of Israel. Today, the Ethiopian Orthodox Tewahedo Church, part of Oriental Orthodoxy, is by far the largest denomination, though a number of Protestants (P'ent'ay) churches have recently gained ground. Since the 18th century there has existed a relatively small (uniate) Ethiopian Catholic Church in full communion with Rome, with adherents making up less than 1% of the total population. The name "Ethiopia" (Hebrew Kush) is mentioned in the Bible numerous times (thirty-seven times in the King James version). Abyssinia is also mentioned in the Qur'an and Hadith. While many Ethiopians claim that the Bible references of Kush apply to their own ancient civilization, pointing out that the Gihon river, a name for the Nile, is said to flow through the land, some scholars believe that the use of the term referred to the Kingdom of Kush in particular, or Africa outside of Egypt in general. The modern name Ethiopia is from the Greek term Aethiopia used to translate Kush, and was applied to all of Sub-Saharan Africa, including what is now Sudan, but with a few classical geographers giving more detailed descriptions of present-day Ethiopia and Eritrea (e.g. Adulis) as well. Islam in Ethiopia dates back to the founding of the religion; in 615, when a group of Muslims were counseled by Muhammad to escape persecution in Mecca and travel to Ethiopia via modern-day Eritrea, which was ruled by Ashama ibn Abjar, a pious Christian king. Moreover, Bilal ibn Ribah, the first Muezzin, the person chosen to call the faithful to prayer, and one of the foremost companions of Muhammad, was from Abyssinia (Eritrea, Ethiopia etc.). Also, the largest single ethnic group of non-Arab Companions of Muhammad was that of the Ethiopians. According to the most recent 2007 CSA governmental data, Muslims are 33.9% of the population, up from 32.8% in 1994 (according to the census data of that year). The U.S. State Department, however, estimates that "approximately 45 percent of the population is Sunni Muslim." Most Ethiopian Muslims are Sunni, and some belong to various Sufi orders. Islam first arrived in Ethiopia in 614 with the First Migration to Abyssinia. Addis Ababa, Ethiopia's capital city, is home to about 443,821 Muslims or 16.2%. Central Statistical Agency. While Muslims can be found in almost every community, Islam is most prevalent in the Somali (98.4%), Afar (95.3%) and Oromia (47.5%) Regions. Areas inhabited by the Beta Israel before their mass aliyah. The Beta Israel, also known as the Falashas (though this term is considered derogatory), are a long-isolated group of African Jews who have lived in Ethiopia since antiquity. Their existence was not widely known to the outside world for many years, and they likewise were not aware of other Jewish groups outside of their own community. They became known to the West during the 19th and 20th centuries, and were accepted as Jews by the Israeli government in 1975. After this, Operation Moses and Operation Solomon, conducted in 1984 and 1991, respectively, airlifted the vast majority of the Ethiopian Jewish population to Israel, where there is currently a population of 150,000 Beta Israel. A small Jewish community still exists in Ethiopia, although it is mostly composed of Falash Mura, Ethiopian Jews who converted to Christianity in the past, and as such have not been recognized as Jews by the State of Israel, but have returned to Judaism (the Falash Mura now number some 22,000). The Bahá'í Faith in Ethiopia begins after `Abdu'l-Bahá wrote letters encouraging taking the religion to Africa in 1916. Mr. Sabri Elais, then a 27-year-old Bahá'í from Alexandria, Egypt, introduced the Bahá'í Faith to Ethiopia in 1933. A year later, in November 1934, the first Bahá'í Local Spiritual Assembly of the country was formed in Addis Ababa. In 1962, Ethiopia Bahá'ís had elected a National Spiritual Assembly. By 1963, there were seven localities with smaller groups of Bahá'ís in the country. The Association of Religion Data Archives estimated that there were around 27,000 Bahá'í adherents in 2005. The Ethiopian community celebrated its diamond jubile in January 2009. As of 2016[update] the largest Bahá'í community is in Addis Ababa. A number of towns (such as Awassa, Nazareth, Mekele, Zway and Shashemenie) and rural areas in Oromia and the Southern Nations, Nationalities, and People's Region (SNNPR) have active and growing Bahá'í communities. An estimated 2.6% of Ethiopia's population adheres to various traditional faiths, according to the 2007 census (down from 4.6% in the 1994 census data). The largest numbers of practitioners of traditional religions are in the SNNPR (about 993,000 people) and Oromia (895,000). Freedom of religion is provided by the constitution of 1995, and freedom of worship had also been guaranteed by the 1930 and 1955 Constitutions of Ethiopia, although in certain localities this principle is not always respected in practice. There is no state religion, and it is forbidden to form political parties based upon religion; all religious groups are required to register with the government, and renew their registration once every three years. It is a crime in Ethiopia to incite one religion against another. There is some tension between members of the Ethiopian Orthodox Church and Protestant Christians, as well as between the Ethiopian Orthodox and Muslims. According to the Barnabas Fund, 55 churches were torched in March 2011 in the Jimma Zone by Muslims after a dispute. A 2015 study estimates some 400,000 believers in Christ from a Muslim background in the country. ^ "CIA – The World Factbook – Ethiopia". Cia.gov. Retrieved 16 March 2009. ^ `Abdu'l-Bahá (1991) [1916–17]. Tablets of the Divine Plan (Paperback ed.). Wilmette, IL: Bahá'í Publishing Trust. pp. 47–59. ISBN 0-87743-233-3. ^ Hassan, Gamal (2008). Moths Turned Eagles, Addis Ababa, Ethiopia; The National Spiritual Assembly of the Bahá'ís of Ethiopia. ^ Hassall, Graham. "Ethiopia". Research notes. Asia Pacific Bahá'í Studies. Retrieved 21 December 2008. ^ Rabbani, Ruhiyyih, ed. (1992). The Ministry of the Custodians 1957–1963. Bahá'í World Centre. p. 398. ISBN 0-85398-350-X. ^ Compiled by Hands of the Cause Residing in the Holy Land. "The Bahá'í Faith: 1844–1963: Information Statistical and Comparative, Including the Achievements of the Ten Year International Bahá'í Teaching & Consolidation Plan 1953–1963". pp. 28, 55. ^ multiple (January 2009). "North American Bahá'í Choir in Ethiopia 2009". Retrieved 30 August 2009. ^ "Families and youth identified as keys to reducing poverty". News.bahai.org. Retrieved 16 March 2009. ^ Taddesse Tamrat, Church and State. ^ Johnstone, Patrick; Miller, Duane Alexander (2015). "Believers in Christ from a Muslim Background: A Global Census". IJRR. 11: 14. Retrieved 20 November 2015. Berhanu Abegaz, "Ethiopia: A Model Nation of Minorities"
This page was last edited on 10 April 2019, at 02:07 (UTC).